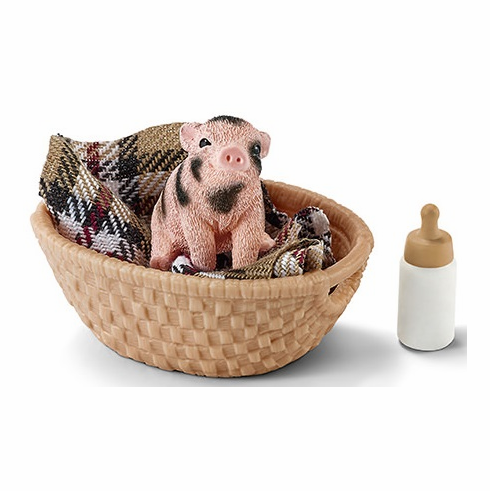 Schleich - Mini Pig w/ Bottle. Includes Pig, Blanket, Bottle & Basket. Mini Pig measure about 1" snout to curly tail. At first, young miniature pigs need to be lovingly fed from a bottle until they can digest solid food. When they get tired from lots of running around and playing, they jump into their lovely basket and cosy up in the warm blanket for a short nap. Miniature pigs are fast, keen learners. You can even teach them to use a cat litter or walk on a lead like a dog. They�re especially ideal for people with animal allergies, as they shed a lot less allergenic skin cells than other pets.